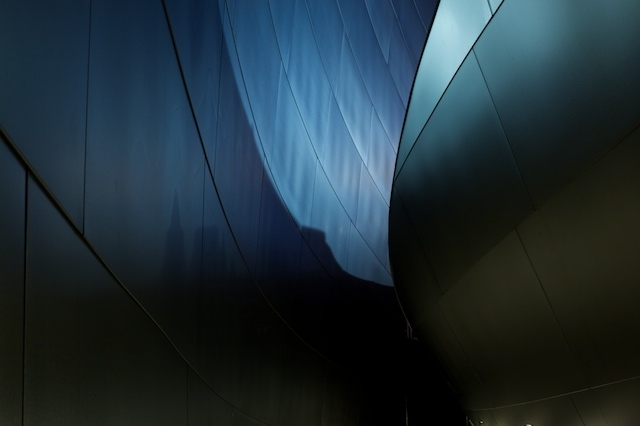 i've driven by the disney concert hall many times, and seen it from afar, both approaching and departing downtown. but only recently did i discover that there is a foot path which snakes around its perimeter, offering entirely new views of this iconic building. the forms are of course beautiful, but walking close to the building affords incredible close up perspectives of it's undulating forms and canted angles. at night the city softly reflects off of it's buffed steely surface, creating really unusual colors, and giving the sense that the building is simultaneously part of and transcending the city.